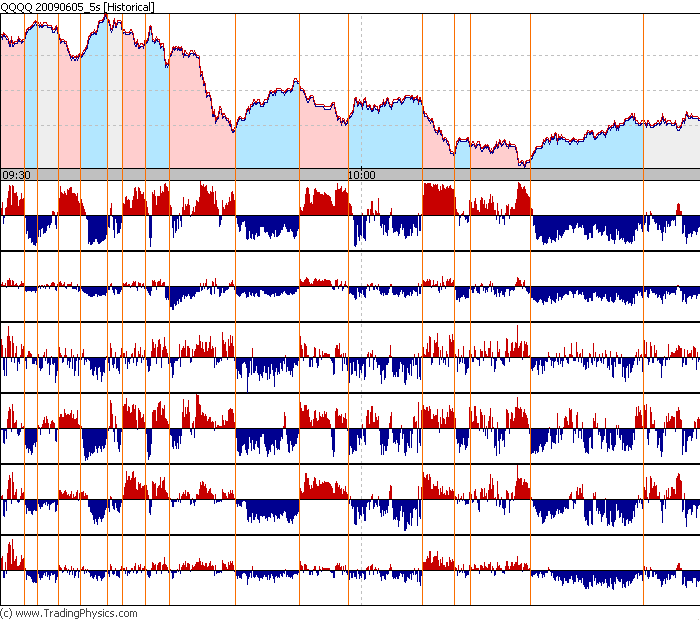 Below is the estimation of this regression for a selection of stocks for the 3-week period of May 21 - June 12, 2009 using five-second tick intervals from 9:30 AM to 4:00 PM EST (4680 observations). Three oscillators have been used to explain the variance of stock returns: AQ, A1 and VQ. According to the estimation results presented below, the three oscillators explained 50-80 per cent of the variance. Extremely low p-levels for all stocks and days, as well as stability of the estimated regression coefficients measuring oscillator's impact on price (a1, a2, a3), indicates that each oscillator contribution to price movements is highly significant statistically. Note: you can reproduce the results by using the original datasets. Each file contains changes in stock price and corresponding changes in oscillators.